In Post-Byzantine iconographic representations on Mount Athos we encounter the artistic representation of musical instruments. Examples include the representations in the Sacred Monastery of Koutloumousiou, and we will mention others in our future posts. This shows a percussion instrument, probably of Persian origin. 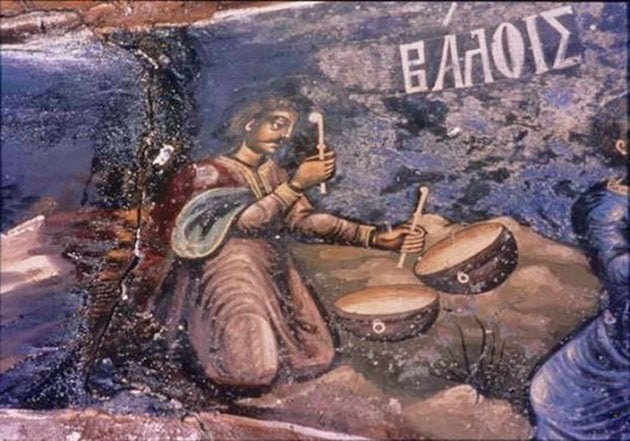 The nakers appear in Byzantine iconography from the 12th century onwards, a pair of kettle-like percussion drums of the same size hemispherically, with the open side covered by a membrane attached usually with ropes. They are struck with two thin keys that are called "xyliphia" (wooden sticks). In iconography they are depicted with other instruments during festive or glorification occasions, such as the Ainoi (the Praises sung during Matins based on Psalm 150). They are always played by men in a standing or sitting position. They are called anakara or nakara. These names are encountered sporadically in texts of the Late and Post-Byzantine period. In the Suda it says it was often hung from the backs of horses and camels. Source: "Glossary of Musical Instruments of the Byzantine and Post-Byzantine Period", in Greek Musical Instruments, Searches in Iconographic and Literary Evidence (2000 BC - 2000 AD), Thessaloniki 2012. Translation by John Sanidopoulos.